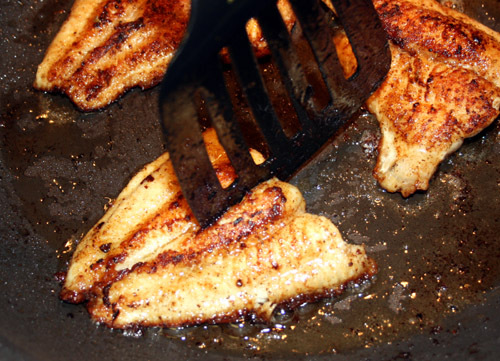 Pan fried fish can be as good or better than deep fried fish... depends on how you do it. I like a pan fried fish with no flour or coatings other than seasonings. 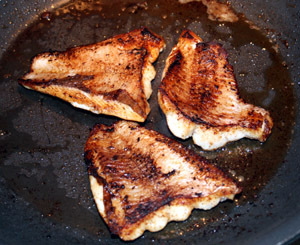 This pan fried fish recipe is not blackened fish, but the fish is browned. I use a big non-stick pan, you can use a cast iron skillet if you wish. Remember; sticking can be a problem if the pan is not prepared correctly. I prepare my pan by putting it on a high fire and spraying a light coat of cooking spray on it. Let it to continue to heat until it just starts to smoke. Then turn the fire off and let it cool for at least 10 minutes. You can do the same thing with a cast iron skillet. I used catfish filets to do this, you can use any fish you can get. Season all the filets by sprinkling the seasoning and pressing it into the meat. Get a spatula to handle the fish. If you have 10-12" filets cut them in half unless you're using a fish spatula; it's all about handling the fish easily without breaking it up when it's almost cooked. You may also want to use a splatter shield. Before we start, understand that we're going to work with heat settings. Heat the pan on medium heat and add the butter. When the butter is melted put some fish in the pan. Leave it on one side for about three to four minutes. Move them around every so often to assure they're not sticking Flip one piece to check the brownness. If it's partially browned flip them all and continue to cook until the other side is browned. NOW, we've got our browning done so let's finish the cooking. Turn the heat down to med-low and continue to cook until it's done. When is it done? How can I tell? Let's stop here... cooking time depends on the thickness of the filet. Testing the degree of doneness is as simple as taking your spatula and gently pushing on the thickest part of the filet in the spinal bone line. If you actually have to push it's not done. If you very gently push and the meat separates... it's done. Here's what it looks like in pictures. This the level of brown I like. Notice the amount of oil in the pan...very little. Here the fire is lower and I'm testing doneness on the spinal line (the thickest part of the meat) with the spatula. Once it's out of the pan put six or eight drops of lemon juice on each piece. Not to much, you just want a tinge of lemon flavor. If you have other sauces you like on your fish go for it. This recipe is not a secret seasoning venture but more so a "how to" demonstration. I didn't tell you this up front but the side for this meal was angel hair pasta. Boil the pasta on the side and strain. Here's what I'm thinking... We have a pan with butter and fish grimeens (bits of browned meat left after cooking)... not letting that go to waste right? I sautéed some purple and green onion in the fish pan. 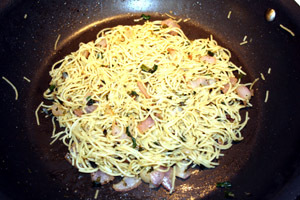 Threw the pasta in and sprinkled a little Cajun seasoning and parsley flakes on it. Stirred it up and "bingo"... a simple side.